Outback & their Free Steak! | The Food Hussy! 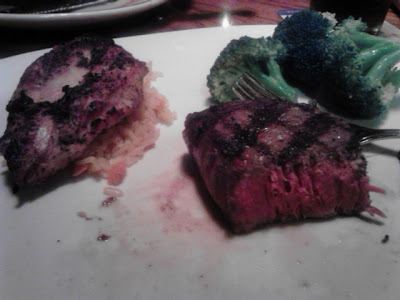 Outback & their Free Steak! Recently Outback Steakhouse gave away free steaks to a million people! Woohoo! So I got my coupon for a free 6 oz coupon with one side a couple of weeks ago. Before I knew it - the coupon was expiring - so I grabbed a friend and off we went. Classic Seasoned & Seared: Our classic bold style, seasoned & seared on a red hot grill. Wood-Fire Grilled: Our new style, lightly seasoned & flame grilled over oak wood. The steak was cooked PERFECTLY. I cut off the end to show the perfect medium rare - I was impressed. It even had a great flavor. I'm normally the girl that douses steak in Worcestershire sauce (easier to spell than pronounce oddly enough) - but this didn't need it at all! The 6 oz size with the giveaway was small but when paired with the broccoli and some fries - it was definitely a full meal. They also have a pretty extensive online ordering system and curbside pickup - which is pretty nice. Why Should You Go? I was really impressed with the quality of the steak - and I'd recommend the wood-fire grill since it was so perfect! My friend ordered a half-rack of ribs and they also looked great. Surprisingly enough to myself - I will definitely be back to Outback! I got one of the free steaks and it was not so much. Meduim rare cooked as stated but the cut of meat was just way too tough. My partner tried a small bite and said how can you chew this its so tough. She got another cut of steak and it was tasty as I tried a bite. Why give someone a free steak that was sub-par with the hopes of making them a new return customer. I never got my free steak coupon and signed up the day it was announced. I am very disappointed. This is going to be my 2nd bad experience with Outback. I'm sure they got my requests because I now receive email from them and didn't before, but no coupon. I must know the following: Why did you order chicken for your husband? Was he not with you? Also, did you tip based on the total bill before the coupon or after? My husband was at school but I always order extra for him to pack in his lunch the next day. I tip on what the bill would have been before the discount.